Excellent experiment! You're like a scientist! haha! The duochrome matte does look incredible. must try for myself! fab pics as always! 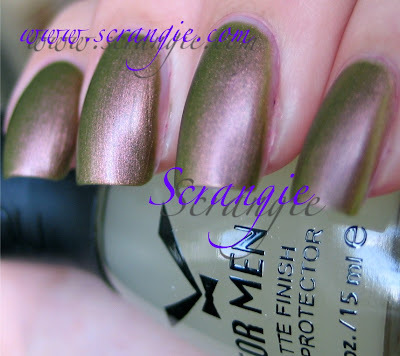 do you have the photo of the matte topcoat over greener that you mentioned before? also do you know the release date for essies matte top coat? The duochrome matte looks perfect! Thanks for posting this! I love the effect on the duochrome! The duochrome still looks fab. I am not surprised that the holo effect was ruined. I think someone did the same thing on the MUA nail board and got the same result. The shimmer or glitter in holo polish acts like the prism to break up light into its variously colored wavelengths. It needs to be able to reflect light to this. That duochrome matte looks amazing! I am going to have to try that, thank you for sharing this with us! I agree, ruining a holo is a crime! I like that matte duochrome though! Ooh I like this - multipurpose polishes! Tried my first matte last week (Zoya Loredana) and really surprised myself with how much I loved it. I bet that W&W Glitz from yesterday would look amazing with a matte topcoat. Reclaim actually looks... kinda cool like that. I was initially horrified that I destroyed DS Fantasy's holo-ness with V yesterday but I grew to like it. It's interesting in a way. Thanks for the post on this topcoat, I'm looking forward to the comparison post (although I will probably pick up Matte About You as soon as I can get my hands on it). I am so bummed that the matte holo didn't work, I think that would look so cool!! I actually like Reclaim matte =o It's a nice color. =] I will have to try it out when my Nubars come. Thanks for the idea! The duochrome looks very interesting matte, can't wait to see the rest of your experiment! Cool! 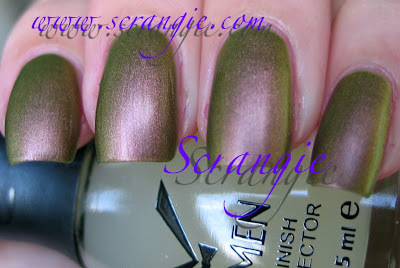 I love both duochrome and matte, so I'm definitely trying this - as soon as I get a matte topcoat! Curious. I've been hearing raves over these matte colors and I must say I was skeptic at first. The photos you posted gives me a second thought. I'd try this when I find the perfect shade. I really like how the duochrome looks as a matte! Gorgeous! I had a really wonderful matte topcoat a few years ago...you're making me want to find it or a good replacement, as I can't even remember the brand. (I only know it was so great, I bought some for my sister and mother.) I look forward to some kind of comparison so I can get the best! Thank you!